Hey guys! I know it's been a while since I last posted, and I apologize.. Things have been go-go-go since August, but I'm not complaining! Think my body's trying to keep up though, as I've been really sick the past 2 days.. Could be another cause, but that's a different story altogether..
Basically, caribilik.com is an amazing website that can help you find the best rooms for your needs. Unlike other sites, not only can you find rooms for rent, you can also find rooms for short term rentals, like home stays. This is good for those of us who do not plan to stay in a particular place for long, as most rooms come with at least a one year contract. Short term rentals are generally cheaper than hotels, and make you feel more at home than motels. For those on a budget, you can even search by cheapest rentals, just by clicking on a tab on the page! Save time and money! Another thing that's great about this site is that it separates its locations very well, so not only do you get categories such as Sabah, Kuala Lumpur, or Selangor (states and federal territories), you also get more detailed locations such as Ampang, Puchong, or Damansara (different areas within each state)! This is great when you're maybe not too sure of the places surrounding the exact location you need to go. 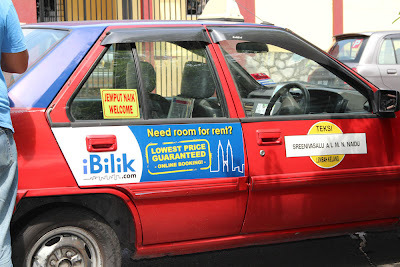 So, as mentioned in the title, for those of you who are scratching your heads looking for rooms, or looking to rent out rooms, I'd definitely suggest checking out ibilik.com as they've not only changed their site name, they've also changed the design so it's now a lot easier to search through their 70,000 listings. With a search button right on the home page, all you need to do is type in key words such as location, and what kind of room you're looking for, say "three bedrooms", and all the listings that match those particular words will come up. Each listing has detailed information, like size, price and contact details, and a lot of the posts also come with pictures of the room/apartment, and a sometimes even a map! ibilik.com also prides itself on having some of the best deals in Malaysia. Was just looking up yout blog name on Google to see if you had updated and your YouTube clip came up from "Behind the scenes : Le Luxe Extreme - Breeze Mag April Fashion Editorial. It is the first time I have seen you speak as I have only previously just seen your photos. I have always thought you were astonishingly beautiful as is your friend Sharin and this clip proved that I was right. I'll admit I was a bit of a pain to everybody a few years back and I hope you will all forgive me for being so. I will try my best to behave in future. A.B. It just had to be said and it's lovely to get a response from the model herself. I just spotted another clip "Fasheo" are there any more? That was sensational as well. I love your expression at 0:55 and all the others of course. A high quality clip and extremely clear. I put up pictures from time to time on a wordpress blog I call "snardleyhonford". Not a professional but I have been doing a fair bit of shooting with some fairly nice equipment, the Nikon D3000 is only an entry level DSLR. I started a photography course earlier this year but started to go crazy (or crazier) because I was analysing every image I saw - even on T.V. Was it framed right, what was the background like, was the lighting right? So it was time to draw back a little being naturally obsessive. However, I got to learn about the work of some great photographers Annie Leibovitz, Adam Pretty and I even got to do a workshop with Meredith O'Shea of The Sunday Age a newspaper in Melbourne Australia. You should be able to find all their work on the internet. Haha.. Yea, that happens.. =) But it's good, I think the photos you have on ur blog are nice, so keep up the good work!! There's a magnificent shot using what must be natural light possibly with a bit of "filler" flash where you're sitting on a rock wearing a wide brimmed hat with a long dress with lots of colours. Was that by Danny T. Digital Art because it's one of those photos that has it all, the skin tones are brought out beautifully. Ah.. I know which one that is.. =) I cant remember who took it, as it was a group event thing, but Danny was one of the photogs.. =) Glad you like it! I've never used candles or natural light for indoors.. Usually my indoor shoots are all in studios.. Interesting concept.. Hmm.. It's worth having a look at the various Barry Lyndon clips on YouTube to get an idea of what he did. Kubrick was a maestro possibly the greatest film director ever, apparently the actors almost melted with the heat! Powerscourt Estate was used for much of the film and Kubrick's obsession with symmetry is evident in many scenes. There might be a row of about 100 soldiers and you can see nearly all their faces for instance. Anyway you can see I like sharing a bit of knowledge! Yours is a knockout photo and something that most girls would love to have of themselves. A.B.